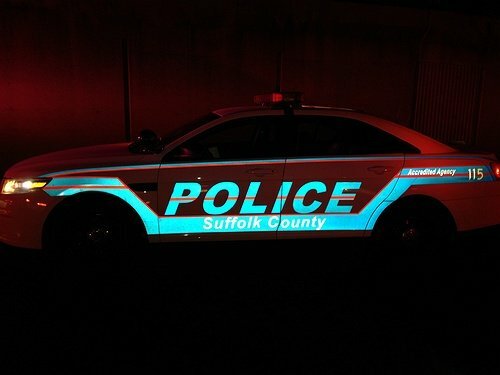 A Suffolk County Police officer saved a man who lit himself on fire in an attempt to commit suicide in Stony Brook last night. Stony Brook, NY - October 15, 2015 - A Suffolk County Police officer saved a man who lit himself on fire in an attempt to commit suicide in Stony Brook last night. Sixth Precinct Police Officer Matthew Merced, assisting Sixth Squad detectives, located a 42-year-old Centereach man in the parking lot of AMC Lowes Movie Theater, located at 2150 Nesconset Highway, who had been reported missing earlier in the evening. Officer Merced spoke briefly with the man and then contacted a family member regarding his location. Upon arrival of the man’s family member, the man reentered his vehicle, proceeded to pour a flammable liquid on his lap and lit a match. Officer Merced pulled the man through the passenger door of the vehicle as the passenger compartment became fully engulfed in flames. When he was removed from the vehicle, the lower portion of the man’s body was on fire and Officer Merced extinguished his clothing by rolling the victim on the ground and smothering the flames with a sweatshirt. The man was transported to Stony Brook University Hospital for treatment of his burns and further evaluation. Officer Merced suffered injuries to his shoulder and arm and was treated and released at Stony Brook University Hospital. Subject: LongIsland.com - Your Name sent you Article details of "SC Police Officer Saves Man Attempting to Commit Suicide at AMC Lowes Movie Theater Parking Lot"